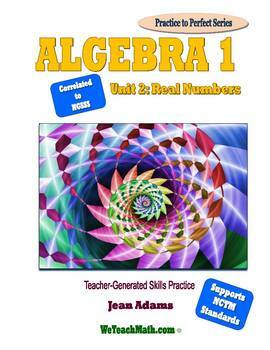 The Language of Algebra-Unit 2 is just one in my Practice-To-Perfect series of reproducible, skill-oriented activity books. The Algebra 1 series is designed as a resource for pre-algebra and algebra teachers who are looking for an effective way to offer additional practice to their students. 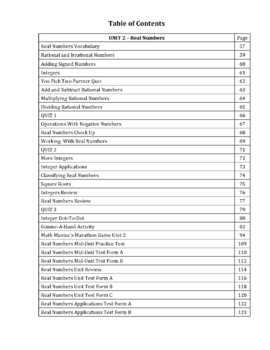 Each activity is correlated to the NCTM Standards. The activities have been developed to help students master the basic skills necessary to succeed in algebra. Assignments may be used by themselves, as supplemental material, or as enrichment for a rigorous mathematics program. Activities are sequenced to help insure successful completion of each task in an effort to build self-confidence needed for academic success. assessments,and two applications assessments. There are both Mid-unit and End-unit reviews, and a "You Pick Two" partner quiz. All documents have answer keys. 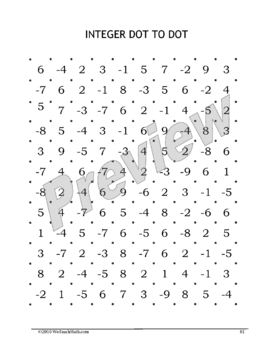 As enrichment, you will find Integer Dot-to-Dot, Gimme-A-Hand Activity for integers, and the Math Maniac's Marathon Game.